Charlie spotted an article by Mark Bittman about making soup, Creamy, Brothy, Earthy, Hearty, in the New York Times. We hope to try many of the recipes given. 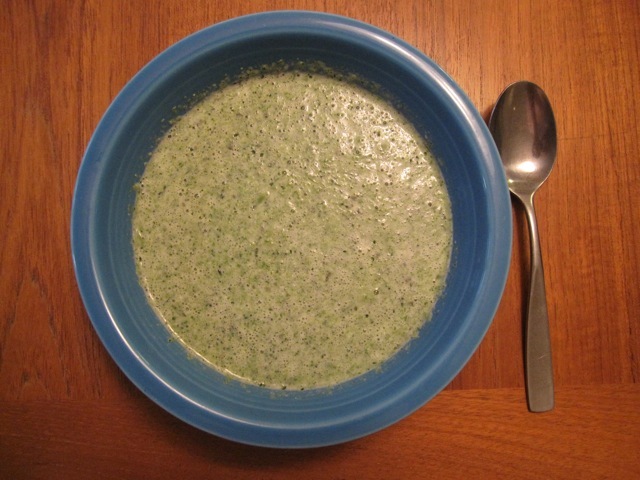 We started with the Creamy Spinach Soup, made a few adjustments of our own, and this is what we've settled on after making it several times. Very good and fast and easy to make. In a large pot, bring the stock to a boil. Chop the green chile (if using) and add to stock. In a large skillet, saute onions and garlic in the oil till golden. Add to the stock pot when done. Cook cabbage in the skillet till tender. Won't take long. Add that to the pot. Cook spinach in the skillet till wilted. Will be fast! Add that to the pot. Bring everything to a boil and boil for a few minutes. Puree everything right in the pot with a hand-held blender or puree with regular blender. Stir in yoghurt (or see variations below). Reheat before serving, but do not bring to a full boil. Optional: If you didn't include green chile, add a little balsamic vinegar. A little adds a nice depth to the soup. Be careful not to overdo. Serve with a dollup of yoghurt on top. Use zucchini instead of cabbage. Slice about 1/8 inch thick, coat with olive oil, and roast in 425 oven till slightly browned (stir every 5 minutes till done). Use a large head of broccoli instead of cabbage. Coarsely chop the broccoli. Sautee the broccoli till tender but not over-cooked. Instead of stirring in yoghurt, let people stir in as much as they like at the table. Use roasted carrots instead of broccoli.